TSPSC Veterinary Assistants Recruitment Results, Certificates Verification 2018, Web Options Dates 2018/ TSPSC Veterinary Assistants Recruitment Results, Certificates verification dates/ TSPSC Veterinary Assistants Recruitment 2017 Hall tickets, Results, Answer Key, Exam date: TSPSC Veterinary Assistants Recruitment 2017 Online application form, TSPSC VA Posts, TSPSC Veterinary Assistant Posts 2017/TSPSC Veterinary Assistants Recruitment: TSPSC has published the 541 Veterinary Assistants Recruitment notification on June 1 and Online applications are invited from the eligible and interested candidates for filling up the 541 Veterinary Assistant posts in Animal Husbandry Department. This is very good news for the candidates who are looking for TS Veterinary Department jobs. Interested and eligible candidates should prepare for applying for this recruitment and they should submit their online application through online mode at tspsc web portal. For more information regarding TS Veterinary Assistant Jobs 2017 details like Age limit, Selection procedure, how to apply, eligibility criteria details are given here for information purpose. The List of Hall Ticket Numbers of the candidates who are provisionally selected for the above post on the basis of Written Examination held on 23-07-2017 is hosted on the Commission’s website (www.tspsc.gov.in). On the basis of the results of the written examination held on 23/07/2017 and verification of certificates held from 04/10/2017 to 11/10/2017 and 03/05/2018 to the post of VETERINARY ASSISTANT IN CATEGORY (4) OF CLASS-A IN ANIMAL HUSBANDRY DEPARTMENT.The following registered numbers have been provisionally selected for appointment to the post of VETERINARY ASSISTANTIN CATEGORY (4) OF CLASS-A IN ANIMAL HUSBANDRY DEPARTMENT vide Commission’s Notification No.30/2017 subject to the following conditions. 1. In continuation of result notification for verification of certificates dated 23/09/2017 and 04/10/2017, it is hereby informed that on the basis of the Hon’ble High Court orders in W.P. No’s 41464/17, 41894/17, 41716/17, 42370/17, 41879/17, 42363/17, 42034/17, 44500/17, 41718/17, 867/18 and 8686/18, the following candidates are called for verification of certificates on the basis of the Written Examination held on 23/07/2017 to the post of Veterinary Assistant in Animal Husbandry Department. The certificate verification does not provide ipso facto right to selection. The certificate verification is being done subject to outcome of appeals / Final orders in the Court Cases. 2. The candidates who are admitted for the verification of Certificates are required to produce the Original Certificates along with one set of Photostat copies duly attested by Gazetted Officer, relating to Age, Qualifications Community (Integrated) , Latest Creamy Layer exemption certificate in case of B.Cs as per Memo No.3009/BCW/OP/2009, Government of Telangana, Backward Classes Welfare (OP) Department, Dt:18/12/2015 (prescribed format hosted on Commission’s website), Certificates relating to claim of age relaxation, Study (from 4th class to 10th class), basic information data (Check List(1set), attestation forms (2 sets) and if any, at the time of verification of documents, failing which, they will not be admitted in subsequent process of selection. No request will be entertained for subsequent submission of any of the above certificates. In terms of the notification, the candidates should possess the requisite qualifications as on date of notification i.e., 02/06/2017. 3. As per Notification, “The post of Veterinary Assistant in Animal Husbandry Department 100% reserved in Sheduled/Agency areas for local ST’s only. In this regard the ST Candidates in Agency areas should produce local area certificate issued by the concerned Thasildar/Mandal Revenue Officer is criteria for local candidature. 4. The verification of certificates will be held in the office of TSPSC, Prathiba Bhavan, Nampally Hyderabad on 03/05/2018 The candidates are requested to obtain and keep ready all the certificates as mentioned in the Notification. 5. If, on further Verification it is found that any candidate is not eligible with reference to the particulars furnished by him/her in the Application Form / Check List / Certificates, the results of such candidate / candidates shall be cancelled at any stage of selection proces. It is hereby informed that the List of Register Numbers of the candidates provisionally admitted for Interview for the above posts are hosted on the Commission’s website. For further details Candidates can visit (www.tspsc.gov.in). It is hereby notified that on the basis of the Written Examination held on 27/08/2017 to the posts of Veterinary Assistant Surgeon in Animal Husbandry Department, the candidates with the following Register Numbers have been provisionally admitted for the ORAL TEST (Interviews). 2. The candidates who have qualified for Oral Test (Interview) are required to attend at TSPSC Office on 25/01/2018 at 10:00 A.M along with Original Certificates, Hall Ticket, and two (2) passport size photos on the relevant date and time as mentioned in the following schedule. 3. If, on further verification, it is found that any candidate is not eligible with reference to the particulars furnished by him/her in the Application Form / Check List / Certificates, the results of such candidates candidature shall be cancelled at any stage of selection process. TSPSC Veterinary Assistant Web Options: The candidates who attended certificate verification for the above post are informed that, some of the candidates have not exercised their web options and some candidates submitted blank PDF’s regarding web option. Hence, they are once again given an opportunity to exercise web options for District preference from 04/01/2018 to 06/01/2018 through link provided on the Commission’s Website (www.tspsc.gov.in ) Web options received online are only considered for selection process. In continuation of result notification for verification of certificates dated 23/09/2017, it is hereby informed that all the candidates with minimum qualifying marks are called for certificate verification on the basis of the Written Examination held on 23/07/2017 to the posts of Veterinary Assistant in Animal Husbandry Department, in order to avoid delay in the process of recruitment due to multiple phases of certificate verification. 2. The candidate who are admitted for the verification of Certificates are required to produce the Original Certificates along with one set of Photostat copies duly attested by Gazetted Officer, relating to Age, Qualifications Community (Integrated) , Latest Creamy Layer exemption certificate in case of B.Cs as per Memo No.3009/BCW/OP/2009, Government of Telangana, Backward Classes Welfare (OP) Department, Dt:18/12/2015 (prescribed format hosted on Commission’s website), Certificates relating to claim of age relaxation, Study (from 4th class to 10th class), basic information data (Check List(1set), attestation forms (2 sets) and if any, at the time of verification of documents, failing which, they will not be admitted in subsequent process of selection. No request will be entertained for subsequent submission of any of the above certificates. In terms of the notification, the candidates should possess the requisite qualifications as on date of notification i.e., 02/06/2017. Revenue Officer is criteria for local candidature. 4. The verification of certificates will be held in the office of TSPSC at JNTU Kukatpally, Hyderabad from 07/10/2017 and 09/10/2017 to 11/10/17. The candidates are requested to obtain and keep ready all the certificates as mentioned in the Notification. 5. If, on further Verification it is found that any candidate is not eligible with reference to the particulars furnished by him/her in the Application Form / Check List / Certificates, the results of such candidate / candidates shall be cancelled at any stage of selection process. The candidates who have applied for above posts are hereby informed that, it is decided to give a chance to correct their wrongly entered data by way of giving Edit Option. In this regard, the candidates are directed to go through the following instructions. 1. Candidates are informed that this Edit Option will be considered strictly for one time only. Hence, the candidate should show utmost care while using Edit Option as this Data will be considered up to final selection. 2. The candidates are instructed to view their Bio-data in PDF and download other Particulars which is made available to him to easily identify the wrongly entered data that he entered in his respective application. Candidates may download their corrected PDF for future reference. 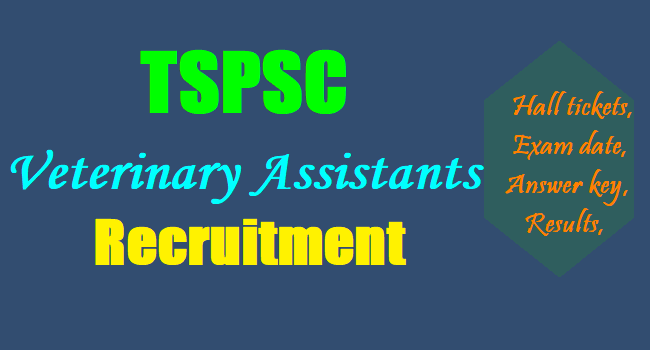 TSPSC to fill up of 541 TS Veterinary Assistant Posts through direct recruitment in Animal Husbandry Department, Dairy Development and Fisheries Department. It is very essential to fill up the Veterinary Assistant posts, as the Veterinary Assistant will assist the Graduate Veterinarians in Veterinary Institutions such as Veterinary Dispensary, Veterinary Hospitals, Veterinary Polyclinic etc., in carrying out day to day activities. Veterinary Assistant also conduct vaccination in livestock, deworming in sheep and goat, participates in extension campaigns, primary sector mission programmes under the guidance of concerned graduate veterinarians. Applications are invited Online from qualified candidates through the proforma Application to be made available on Commission’s WEBSITE (www.tspsc.gov.in) to the post of Veterinary Assistant in Category (4) of Class-A in Animal Husbandry Department. Selection process: Candidates will be selected based on performance in written examination conducted by the Director of Animal Husbandry Department. 80% weightage given to the written examination marks and 20% weightage given to the academic marks. NOTE: The question paper of Preliminary (Screening Test) will be supplied in English version only. The question paper of Main examination will be supplied in English version only except languages. Hall tickets for Written Examination for the Post of Veterinary Assistant in Category(4) of Class-A in Animal Husbandry Department omr based examination (General Recruitment)Notification No. 30/2017. Date of Examination:: 23-07-2017 FN & AN.